FRANKFURT -- Why is General Motors looking for a way out of Europe? That's easy. While home to many of the oldest and most venerable car brands in the world, Europe also may be the most brutally competitive and demanding market, with a complicated patchwork of regulations under which a host of American, European and Asian brands do battle. Thanks to the effects of the ongoing eurozone debt crisis, volumes in Europe remain roughly 1 million vehicles off the 2007 pre-crisis peaks. Growth essentially comes solely from replacement demand as population growth in the region is largely stagnant and vehicle ownership rates remain unchanged. With fewer cars sold in the past decade, industry overcapacity became a bigger and bigger problem. Former General Motors CEO Dan Akerson famously said five years ago that Europe had anywhere between seven to 10 car plants too many. Since then, just three have been shut: Ford's factory in Genk, Belgium, PSA's assembly lines in Aulnay, France, and GM's own Zafira MPV site in Bochum, Germany. Even if this was fixed, the market itself is anything but lucrative. Dealer throughput is a fraction of that in the U.S., making it harder for retailers to refurbish and invest. Sales are dominated by small, low-margin cars with downsized engines often no larger than 1.6 liters, half of which are diesels needed to meet burdensome carbon emission targets. Four of the five top-selling models last year were subcompact hatchbacks, according to JATO Dynamics. European models are both too diminutive to sell in major markets such as the U.S. or China and too expensive to compete pricewise in emerging economies such as Brazil and India. Importing small cars engineered for other markets likewise doesn't work, since customer demands are far higher. Ford tried to latch onto the boom in subcompact crossovers in Europe by introducing its EcoSport from India only to find that a vehicle designed to survive the disastrous road conditions of the local economy flopped when introduced to the high-speed autobahns of Germany. "Europe is not only an incredibly competitive and crowded market, it's also an incredibly complex market: 31 countries each with their own regulations and taxation regime," Kia Europe operations chief Michael Cole told Automotive News, fresh from unveiling the brand's next-generation Picanto mini-car here. Questioned by European Union parliamentarians about the patchwork of car taxes, Finance Commissioner Pierre Moscovici admitted last March that the problem was a "source of high administrative burden for citizens," but past legislative proposals to fix this "did not obtain the required unanimous support of member states." Financial reporting practices also differ: U.S. carmakers break out their results by region, creating instant yet often ugly transparency -- particularly when losses in Europe ballooned in 2013. Many companies, however, don't bother informing investors whether their operations in Europe are in the red, including potential Opel owner PSA Group. Volkswagen, for example, did away with regional accounting 10 years ago in favor of global results by brand, helping to conceal its chronic losses in North America. "There are two ways of looking at the European market," said PwC Autofacts Global Lead Analyst Christoph Stuermer. "One is there's no growth and no margins, true, but the other perspective is cars are quite expensive here, so if you are looking at a revenue perspective, Europe is quite nice because -- however little margin you make -- you still make a lot of cash." Both Opel and its suitor, PSA, have seen their brands come under heavy fire from rivals, watching their combined share of the European market shrink from 21.7 percent to 16.3 percent over the past decade. The two have been attacked from above by aspirational brands, hounded from below by value-driven competitors and even flanked from the side by other mainstream brands that aggressively targeted a chronic weakness of their product portfolios -- an absence of SUVs. Luxury brands may be largely reluctant to move downmarket in the U.S., but in Europe, Opel Astra buyers are inundated with their choice of premium compacts. Audi went so far as to even sell the pint-sized A1 in Europe that can appeal to those originally shopping for an Opel Corsa or Adam. In the West European market, where transaction prices are the highest, both BMW and Mercedes-Benz have grown so fast that -- with some minor help from Mini and Smart -- they were actually able to outsell Opel last month. 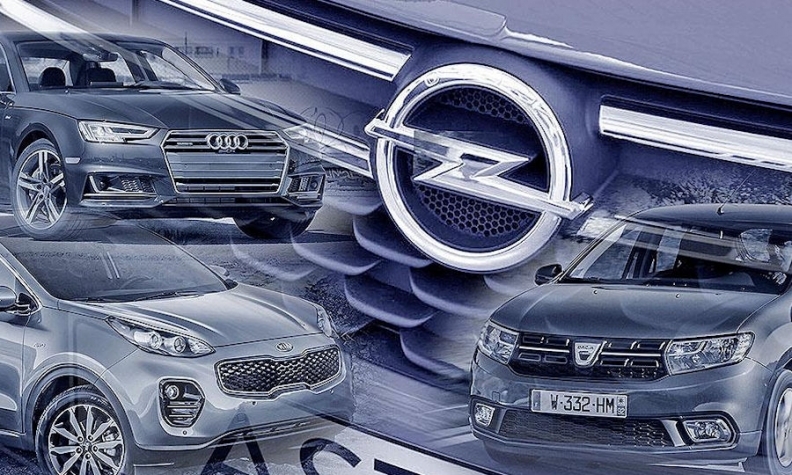 Competition from luxury marques such as Audi, Asian brands such as Kia and Eastern European challengers such as Dacia have eaten into market share for Opel and other mainstream brands in Europe. Just as Mercedes and BMW push lower, upstart import brands such as Hyundai and Kia have built their reputations on smash-hit utility vehicles at a time when traditional European carmakers had nothing to offer. Sales of Kia's Sportage compact crossover rose by a third in Europe last year, nearly reaching 140,000 units, while Opel still has nothing to offer in such a crucial segment. Finally, popular East European budget brands such as Skoda and Dacia, both entirely absent from the U.S., make use of their lower labor costs to attack Opel and PSA by appealing to price-conscious buyers with models that give the most amount of space for the least amount of money, such as the Octavia and Sandero. Competition is indeed so fierce that many Japanese brands have largely given up on Europe. Honda, a major player in North America, controlled just 1 percent of the market last year. Were it not for the Outlander plug-in hybrid's success in the U.K. and the Netherlands, Mitsubishi wouldn't be worth mentioning. Sales of Subaru are so small, the European Automobile Manufacturers' Association doesn't bother reporting them. Kia's Cole said Europe is a market that needs to be fully understood by headquarters back home. When asked whether management in Korea ever once considered throwing in the towel, Cole replied it was just the opposite. He said: "Seoul sees it as absolutely core to their strategy. For Kia, Europe is a growth market, and it's prestigious -- if you succeed as a carmaker in Europe, you can succeed anywhere."